In the penultimate post in this series, we looked at Charlie Adam’s contribution in Blackpool’s relegation. In this final article of post-season analysis, manager Ian Holloway is in the line of fire. Was the man at the helm ultimately responsible for his side going down in their debut Premier League season? In the successful first half of the season, Ian Holloway was almost untouchable, but one game does stand out as a huge talking point. I am of course talking about his controversial team selection at Villa Park, when Holloway opted to change almost his entire team, fielding 10 different players to the ones who had started the previous game against Everton. The reasoning behind this decision was that his core set of players had become fatigued, and he had yet to see what many of his summer signings had to offer. Despite a strong performance from the fringe players, ‘Pool lost courtesy of a late James Collins header, against an Aston Villa team that had been low on confidence. ‘Pool were later fined for breaking Premier League rules on not fielding their strongest team, but a cost even more significant than the £25,000 fine is the missed opportunity to claim a point or even all three. When Blackpool were relegated by such a fine margin, it’s easy to look back now and wonder ‘what if?’. 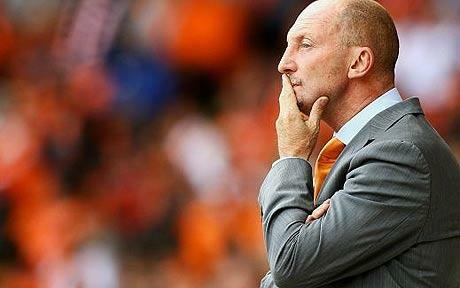 Tactically, Holloway has also come under some criticism for the lack of a Plan B. In a run of bad results in the second half of the season, ‘Pool continued to play in the same way when a couple of ground-out draws might have helped steady the ship. Instead, a cavalier approach was much less effective in 2011 and there was no sign of anything markedly different about the way ‘Pool sought to play. Additionally, Holloway found it difficult to set up his side to close out games they were winning. 22 points were lost from winning positions, and the manager struggled to find a plan to tighten up his defence. One also has to question Holloway’s ability in the transfer market. In the two transfer windows combined, Holloway signed no fewer than 17 players. However, for a quick snap judgement on how many of them made any meaningful contribution, one would struggle to name more than a handful. Too many players were signed and quickly discarded and a hit-rate of around 30% is hardly a ringing endorsement for Holloway’s transfer acumen. The names Martin, Sbai, Kornilenko, Reid and Beattie send a shudder down the spine in the season’s aftermath. Even some of those who initially impressed later fell out of favour. Take Marlon Harewood for instance who, despite scoring five goals, was loaned out to Barnsley in February, while Kornilenko and Beattie floundered at Bloomfield Road. Perhaps the most damning indictment of Holloway’s lack of nous in the transfer market though is the team that he selected for the final few games. 10 of the 11 that started the last four games featured for ‘Pool in the Championship, and nine of those were already at the club, either permanently or on loan, before Holloway took the reins in May 2009. In Holloway’s two years at the club, he has largely relied on the same set of players without being able to add enough better players from his own transfer dealings. Then again, shouldn’t Holloway’s successes be even more highly regarded given he has had a similar team to his predecessors to work with – a team that had battled against relegation to League One for the two previous season? It would certainly be a valid argument. Holloway has turned a team of perceived misfits and outcasts into a side that competed in one of the strongest leagues in world football. Few other managers would have backed themselves to perform as well in the same circumstances, and it is for this reason he was touted for manager of the year awards, in spite of the club’s relegation. Another point that has to be taken into consideration is the finances under which he had to work. Holloway had by quite some distance the smallest ever Premier League budget relative to the rest of the division. Regardless of whether you accept there was a £10,000 per week wage cap on players or not, the season’s accounts will surely bear out that Holloway had a budget more suited to a lower-to-middling Championship team than a club in the top flight. Money does not always equal success, one only has to look at the likes of Hull City for evidence of this, but there can be no doubt it certainly helps. It’s unlikely any other club winning promotion would arm themselves with a budget akin to Blackpool’s and realistically believe that would be enough to survive. For example, this past season’s play-off winners Swansea City, a club of comparable size to ‘Pool, have already signalled their intent with their first summer signing – Danny Graham from Watford for a not insignificant £3.5m. Blackpool’s total transfer outlay probably wasn’t much more than this, and Graham is likely to be picking up a wage worthy of the corresponding transfer sum. Blackpool’s largely disappointing signings were simply endemic of the finance on offer. Could Holloway really be expected to make a silk purse out of a sow’s ear? And the impressive thing is that he very nearly did. When you think of the constraints he had to cope with, it should be viewed as a minor miracle that the Seasiders amassed as many points as they did. 39 points was a more than respectable haul, borne out by the fact it is a point tally that would have kept them up in 12 out of the last 15 Premier League seasons. At some level it can be argued that Blackpool were just unfortunate – there were no hopeless teams and it made the relegation battle a more difficult task than usual. Not guilty. Ian Holloway would do things differently if he had a second opportunity, of that I’m sure. But for a team that was widely expected to be the worst in Premier League history, he didn’t do too badly, did he? The media no doubt painted a more pessimistic picture than deserved, but even the most ardent Seasider would have been sceptical of scoring over 30 points. I’d have snapped your hand off for 39 points before the start of the season, and I’d wager Holloway would have too. Yes, he made mistakes, but he should be commended for delivering on the entertainment front, and reinvigorating football fever on the Fylde coast. This was not a relegation of which to be ashamed. ‘Pool just came up short, but it wasn’t for lack of trying.